My third review of 1997’s important Korean gangster films is actually on the first one that was released (February) during the year. Lee Chang-dong’s Green Fish repositioned concerns of the Korean New Wave filmmakers, such as Park Kwang-su and Jang Sung-woo, into a narrative with much more commercial appeal. After Gangster Lessons, Born to Kill, and Boss all featured in the top 10 Korean films of 1996, the gangster movie was a hot trend and Green Fish did indeed perform very strongly, landing at No. 8 the year it was released. After penning Park Kwang-su’s To the Starry Island (1993) and A Single Spark (1995), Lee burst onto the scene with his debut, starring Han Suk-kyu, hot off the success of the previous year’s No. 1 Korean film The Gingko Bed and Song Kang-ho in a smaller role. Both would feature later that year in No. 3. Kyung Hyun Kim makes this point early in his ‘At the Edge of a Metropolis in A Fine, Windy Day and Green Fish’ chapter in his seminal volume The Remasculinization of Korean Cinema. Lee’s film very pointedly and adroitly examines the encroaching urban crawl as it swallows Green Fish’s protagonist’s humble countryside home upon his return from conscripted military duty. Lee presents the effect of this rapid urbanization in a very literal manner as Mak-dong’s large family unit has been shattered. His father is dead, his mother seems to have gone a little cuckoo, his brother is a paraplegic (a precursor to Lee's third film Oasis, 2002), and his other siblings, including a young club girl and a degenerate, drunk detective, have spread apart. The large brood cannot seem to function in the new urban and suburban space, chiefly the home of small nuclear families. After an opening credits sequence which features a collage of pictures of Mak-dong’s family and home from years past, before Seoul loomed on the horizon, Green Fish begins with a scene on a train. Mak-dong is returning from the army and is sticking his head out between carriages. He looks to the left and sees an attractive woman do the same, though she is oblivious to him. Her red shawl comes undone and floats down towards him, whipping across his face. Back in the carriage he notices a trio of young thugs harassing her and gets involved only to get soundly beaten. They get off at the next stop and he trots after them with a heavy object and whacks one of them across the head before scampering back to the train, but it’s already leaving so he must run away. Having left his bag on the train, he is now without any possessions. This, coupled with the new landscape he comes home to, indicates an inevitable new beginning for him. As he stands in his house’s door frame, he discards his military jacket, Lee opts to shows this using slow motion. The train motif indicates the modernization of society, much in the same way that locomotives featured in some of the greatest Hollywood western films like Sergio Leone’s Once Upon a Time in the West (1969). 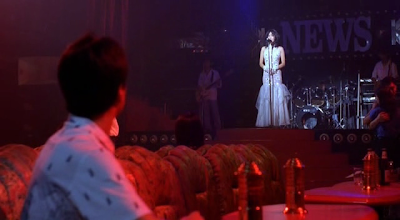 Lee would employ train motifs even more prominently in his next film Peppermint Candy (1999) as his camera followed one in backwards shots in between the film's reverse chronological sequences. The red shawl is important because of its color, which indicates lust, love, blood, and the criminal underworld and because it covers his face. From the moment this happens, Mak-dong has begun to tread on a descending path into the underbelly of modern Seoul. The woman is Mi-ae, the lover of Mak-dong’s future gang boss and she serves as an unwitting femme fatale. It is his infatuation with her that ultimately leads to his downfall. But Mi-ae is not Mak-dong’s only reason for eventually assuming a role as a low-level gangster. His masculinity is put into question since he can’t fend a few young bullies and because at the time of his return, he is unable to prevent his mother and sister from performing demeaning duties for income. The thugs who disrespect Mi-ae and gang up on Mak-dong represent an apathetic and displaced youth prone to violence. Chung Doo-hwan’s autocratic regime fell in 1988 and with it a certain respect for authority. Despite Mak-dong’s uniform which identifies him as a soldier, the youths attack him anyway. 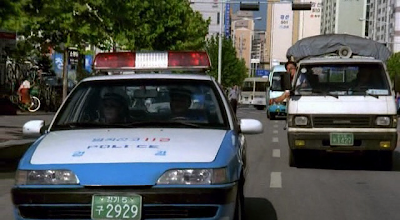 Another example of this in the film is when Mak-dong rides in his brother’s egg truck. After he gets pulled over for running a red light he manages to convince the cop to take a 5,000 won bribe. He gives him a 10,000 note and the policeman agrees to go get him some change but then drives off. Mak-dong and his brother then drive after him, swerving beside him and yelling at him to stop the car over an intercom. It’s a funny reversal of roles but also a little alarming that they feel they can behave this way in the face of authority even if the cop is shown to be corrupt, though they are complicit in this. Such behavior would never have been tolerated in Korea in earlier years. 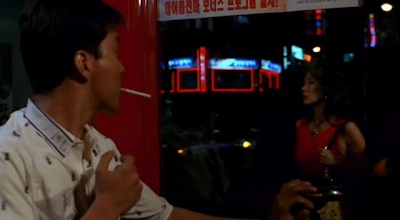 For me the most successful element of the film is the staging of Mak-dong’s descent into criminal life. I’ve already examined his initial encounter with Mi-ae but the next time he sees her it is as a reflection in a telephone booth in an unseemly part of Seoul. He follows her through evocative red lights and past a clownish, foreboding club marketer, who pretends to shoot him in the head, into a big club. She is a singer and appears on stage as a vision of white. Mi-ae is the white rabbit and Mak-dong has followed her down the rabbit hole. Later, Mak-dong gains entry into the gang world not by showing off his wits but by being violent and recalcitrant in the face of perceived authority in the form of Song Kang-ho’s hoodlum character. Just before he is asked to do a job by the gang boss, he is in the main hall of the club. The boss and Mi-ae enter and sit at a booth, she whispers something in his ear and he then shouts for the music to come on. She gets up to dance to a spooky Tom Waits song and ambles in a slow, sultry fashion. It’s a delightfully odd sequence that could nearly be part of a David Lynch film but it fits into Mak-dong’s Alice in Wonderland trajectory. Next he is in a karaoke hall which features a scantily clad American exotic dancer performing on giant collage of TV screens. Does this indicate that Korea’s globalization and contemporary fetish with American culture coincide with a debasement of morals? Mak-dong goes to the bathroom and sings along to the song being performed, he stops at: “An unworthy son has this sin”. He stares at himself in the mirror and then hangs his head before smashing his fingers with the door of a stall. At first this seems like an act of self-mutilation borne out of guilt for the path he has embarked on. In the next scene he begins to harangue the patron who sang the karaoke song until he becomes annoyed enough to take a swing at him. Mak-dong pretends that the patron has broken his fingers. It turns out that this is his first job for the gang but he seems to revel in this self-destructiveness and willingly takes on the pain and he is later admonished by his boss for his youthful disregard for his own health. Mak-dong’s self-destructive behavior continue when later he smashes a bottle over his head as people boo at Mi-ae on stage. In a famous scene that was given tribute in Ha Yu’s exceptional A Dirty Carnival (2006), Mak-dong murders a rival boss in a bathroom and stuffs him in a stall. Just before this he burns Mi-ae’s shawl. Does he do this as he recognizes that he has become an active agent in his own debasement? I find Mak-dong’s character arc to be brilliantly handled by director and writer Lee and performer Han. The story itself is not very original but it is executed well and reappropriates the construct to highlight certain pressing themes in contemporaneous Korea. Besides the few elements I’ve briefly discussed, Green Fish has an enormous amount to offer, a lot of which reveals itself on subsequent viewings. 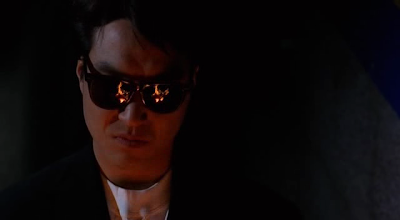 It may not reach the heights of Lee’s later films but it stands as one of the most important works of 90s Korean film. Doesn't try too hard to be too deep or too much of a social commentary. Doesn't make a meal of itself, even in it's more dramatic scenes. Shows how Korea changed too quickly for everyone to adjust. It showed it from the unique perspective of one having returned from military service to find a country in transition and transformation that reflects his own aimless wandering to find his way in life.